Additional value including: process review, standardization, and improvement activities across task orders; an active Senior Advisory Group; and combined staffing capability for quick-turnaround support. 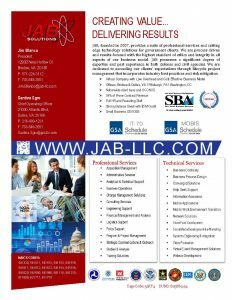 JAB currently provides support from Pre-Award through Closeout. Download a PDF with more information.